Into the Wolf’s Den – ADANAY. You can see the blood on the street, the barrier, and the rail. His name was Cecil Taggart; “Tagg” to the dweller community living underneath the I-40 overpass on the Wolf River. 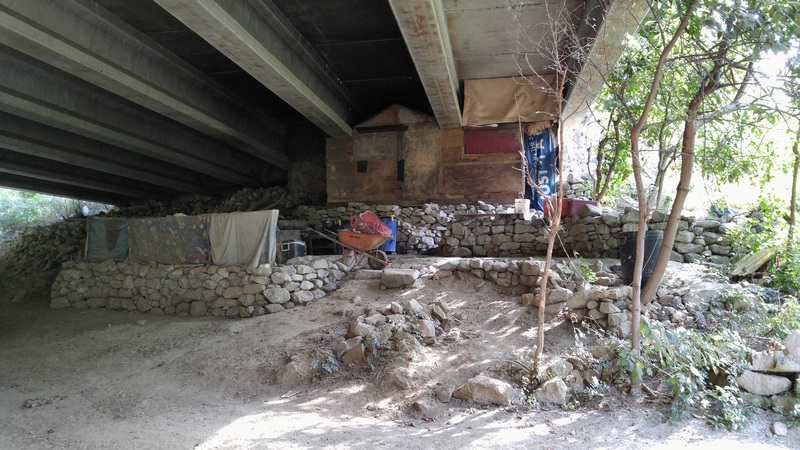 The support rocks have been arranged into steps and a patio for rooms that use plywood and discarded rugs as walls; wood and nails to hang them scavenged from construction sites or stolen in small quantities from the hardware store. It’s a small community, a crew, who came together through various circumstances and hardships to find themselves passing handles that Halloween night. For Tagg, those hardships began as a result of his name. Cecil, the name, allies with a consonance rhyme that befits a not-so-masculine boy such as Tagg. His insistence on being called “Tagg” only fueled the rhyming game and when his full last name was employed as a taunt as children are want to do, well, it was a Sisyphean task to escape. The simplest of childhood games became a playground derision and haunted him from then, to all the way through high school where the touch became a punch. “Fag, you’re hit!” was the great American pastime of his Southern upbringing. His discrimination fueled his anger. His anger garnered their ire. He was outcast by all and found solace in habitual drug use. He hopped boxcars and roamed rail yards, learned the scratched language, and began to envision himself as one of the animals whose howls to which he often drifted asleep. On his wanderings he heard of the Wolf River and traveled to make Memphis his home. Over the toiling years of building his den, hauling rocks when he was fully in this realm, his muscles grew taut and gave him a sinewy appearance. His shaggy hair grew more grey and his long beard came to a scraggly point; a not-so-much cultivated look but a look that he wouldn’t cast aside for he thought that the spirit realm was preparing him for his next life as a wolf. Others came and went through his den but Tagg endured. The transients he was drinking with tonight had been there long enough to learn his name and would probably be gone after they had slept off their hangovers. It was when the last handle dripped dry and the crew elected someone to go get more alcohol that the connection to the childhood game was made: “Tagg, you’re it!” drew throaty laughs that were amplified by the alcohol. Tagg’s beady eyes spied the crews’ faces in the firelight as he rose from his seat, spat profanities and climbed up the bank to the Interstate. The nearest exit was only a few miles down and Tagg wasn’t drunk enough to sleep tonight. Drunk enough to stumble, though. The truck had no time to swerve and ricocheted Tagg against and over the rail, down to the hard pack dirt and rocks below. The crew grabbed a torch from the fire and fumbled their way to inspect the thud. Tagg lay twisted, spitting blood. One of the crew cawed, “Tagg, you’re Hit!” and laughed his throaty laugh. Tagg cursed the throaty laugh and all the laughs laid on him and he bled. He cursed his life and the children and everyone and he died. There is a Darwinian code among hobos and realizing they now had a new place to live, set to fighting for Tagg’s mattresses. There is also an honor code, as well as a desire to not have a dead body out in the open. And finally there is also the belief that graves are dug six feet deep so the dead can’t climb out. But here on the Wolf River a grave will start to flood if you go past four feet so Tagg lies in a shallow grave in front of his den. Every mountain biker knows to keep solemn when passing through the den, especially on Halloween, when some say they’ve seen Tagg the Wolf crawl from his shallow grave and hunt the laughter of children playing their games. He snatches them with his bloody claws and drags them back to his den and they’re never heard from again. So be wary on Halloween: if you hear a wolf howl it could be just a wolf, or it could be Tagg coming to get you.